John Gosden’s with Sevenna Star showed plenty of stamina beat Godolhin's Ispolini in a thrilling finish. Appearing to need every inch of the mile-and-a-quarter trip, the Redoute’s Choice colt stuck on in spirited fashion to give the Newmarket trainer his ninth success in the race. Requiring plenty of encouragement from Frankie Dettori to get into top gear, the 15-8 favourite wore down eventual runner-up Ispolini close to the line before landing the Group Three contest by a short head. Gosden said: “He is a big horse, as you can see, and he is still learning. He didn’t really see anyone around Windsor last time. He did a nice piece of work around there. “It was a good race. The second, third and fourth are good horses. It was a quality trial. “You needed to see out the mile and a quarter in these conditions and Frankie said he was a little dreamy early on, learning about the game, and he was only getting the hang of it the last part. As for Dettori, he believes the winner is still very much a work in progress as opposed to the finished article. He said: “He is a big horse. It took a furlong and a half to get into top gear. 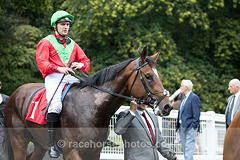 Once I got upsides William (Buick, Ispolini) I knew my horse would do his very best at the end. The Sandown Classic Trial was established in 1953, and it was originally called the Royal Stakes. The first running was won by Mountain King. Ladbrokes became the sponsor of the race in 1971, and from this point it was known as the Ladbroke Classic Trial. [It took place at Kempton Park in 1973]. Subsequent sponsors have included The Guardian, Thresher and Betfred. The online gambling company Bet365 took over the sponsorship in 2008. The Sandown Classic Trial is staged during a two-day meeting which features both flat and jump races. Other events at the meeting include the Bet365 Gold Cup, the Celebration Chase, the Gordon Richards Stakes and the Sandown Mile. The race can serve as a trial for the Epsom Derby. The last participant to win the Derby was Benny the Dip, the runner-up in 1997.